Asphalt shingle is still the most common type of residential roof cover. However, the long history of asphalt shingle has seen a lot of changes. The last few decades, in particular, have been a boom time for asphalt shingle. Asphalt used to be the default residential roofing material just because it was cheap to produce and easy to install. With new technologies, asphalt shingle has become a much more appealing roofing material for lots of reasons. We’ll discuss three types of asphalt shingle and why asphalt is still an excellent choice for any residential roofing project. 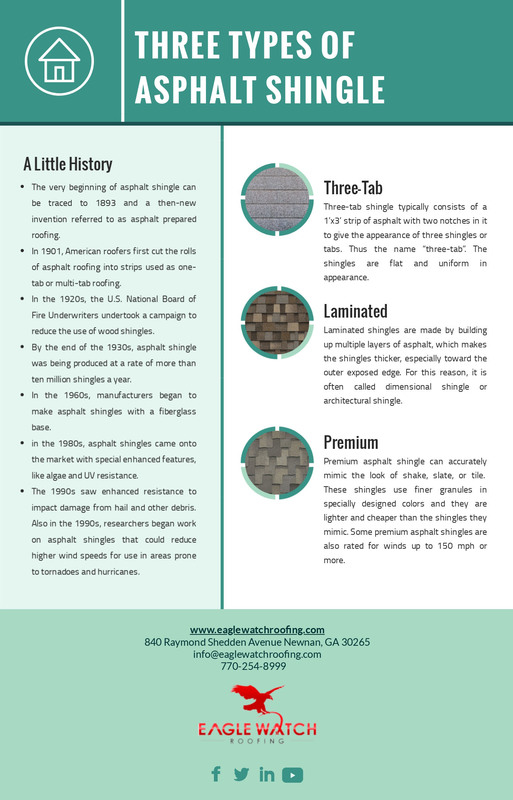 Asphalt shingle has been in widespread use for nearly a century, but its roots go back even further. The very beginning of asphalt shingle can be traced to 1893 and a then-new invention referred to as asphalt prepared roofing. At first, it bore little resemblance to modern asphalt shingle. Instead, it consisted of a long roll of an asphalt-saturated base material, typically organic felt, and little else. In 1897, a significant milestone was achieved with the addition of slate granules. These granules added extra durability to the asphalt and felt base. However, this asphalt roofing didn’t become asphalt shingle until 1901, when American roofers first cut the rolls of asphalt roofing into strips used as one-tab or multi-tab roofing. So you could say that asphalt shingle was born in 1901. The use of asphalt shingle spread throughout the early years of the twentieth century. But the new roofing material really took off in the 1920s, thanks to the U.S. National Board of Fire Underwriters. In the 1920s, the U.S. National Board of Fire Underwriters undertook a campaign to reduce the use of wood shingles in an attempt to create more fireproof cities. In the late 19th and early 20th centuries, fire was still used for heat, light, and cooking. Massive urban fires were a major concern, and more fire-resistant materials were sought after. By the end of the 1930s, asphalt shingle was being produced at a rate of more than ten million shingles a year. The Post-War housing boom of the 1940s and 1950s saw the mass installation of three-tab shingle roofs. Roofers began to use adhesives in addition to nails to increase wind resistance. The first self-sealing adhesives came on the scene, speeding up installation and improving durability. The 1960s saw one of the first significant technological advances in asphalt shingles. Since their invention, asphalt shingles were made with a base of organic felt. The earliest shingles used felt made from cotton rags. When rags became expensive in the 1920s, manufacturers shifted to cellulose fibers from recycled paper and wood. But the in the 1960s, manufacturers began to make asphalt shingles with a fiberglass base. At first, the lightweight shingles were more susceptible to wind damage. But with improvements in the 1970s and early 1980s, fiberglass became the new material of choice for asphalt shingle bases. Beginning in the 1980s, asphalt shingles came onto the market with special enhanced features. One popular feature was granules treated with special algae-resistant additives. The additives prevented the growth of blue-green algae that causes unsightly black streaks on asphalt roofs. Other additives made shingles more UV-resistant. That allowed shingles to keep their color better over time and to resist structural damage from UV rays. The 1990s saw enhanced resistance to impact damage from hail and other debris. Also in the 1990s, researchers began work on asphalt shingles that could reduce higher wind speeds for use in areas prone to tornadoes and hurricanes. From the early days of asphalt shingle, a single design made up almost the entire market. Three-tab shingle typically consists of a 1’x3’ strip of asphalt with two notches in it to give the appearance of three shingles or tabs. Thus the name “three-tab”. The shingles are flat and uniform in appearance. Until recently, they are by far the most common type of residential roofing. Even today, if you drive through almost any suburb, you will see lots and lots of three-tab asphalt shingle. Three-tab asphalt shingle is popular in large part due to its cost. It is one of the cheapest roofing materials out there. When appropriately treated and maintained, three-tab asphalt shingle can last two decades or longer. However, most three-tab shingle is only warrantied for 20-25 years, and it is rare for a three-tab shingle roof to last beyond 30 years. Laminated shingles are made by building up multiple layers of asphalt, which makes the shingles thicker, especially toward the outer exposed edge. For this reason, it is often called dimensional shingle or architectural shingle. The thicker shingles offer two main advantages, appearance and durability. First, let’s consider appearance. One major difference between three-tab shingle and almost every other roofing material is that three-tab shingle is flat. This gives it a characteristic look. However, many homeowners prefer the look of more natural materials like tile, shake, and slate. Building up layers of asphalt in laminated shingles produce a more varied and interesting look that can mimic natural materials. The singles are also built in different shapes and sizes to heighten the illusion of naturalness. Another significant effect of adding multiple layers of asphalt is durability. Laminated asphalt is thicker so it can last longer. Whereas three-tab shingle rarely lasts more than 30 years, many good quality architectural shingles are warrantied for up to 50 years. In the old days, asphalt shingles were simple, cheap, and unexciting. Today, new technologies are producing asphalt shingles that are more expensive but that have all kinds of premium properties to make it worth your money. One area in which roofing manufacturers have invested a lot of research money is in durability. If you live in an area that experiences large hail or high winds, you can get shingles to keep up with the weather. Premium asphalt shingles are available that are rated for winds up to 150 mph or more. These high-end shingles use high-tech adhesives and specialized nails and materials to withstand hurricane-force winds. In areas prone to these kinds of storms, homeowners who spend the money of high-wind shingles may make some of that money back in the form of lowered homeowners insurance premiums. The same goes for impact resistant shingles built for areas with large hail. Another selling point for modern premium shingles is appearance. Laminate shingles already look more organic than the three-tab style, but some manufacturers go beyond that. Homeowners who are interested in a specific look can now purchase asphalt shingle to mimic almost any other material. These shingles use finer granules in specially designed colors. They are also build up with multiple layers and cut into particular shapes. All this combines to make a shingle that accurately mimics the look of shake, slate, or tile. While these looks cost more than other types of asphalt shingle, they are still cheaper than the natural materials. They are also lighter and may avoid the need to install added structural supports for the roof. With the variety of options available today, asphalt shingle has managed to keep up with customer demand and maintain its place as the most common shingle. It’s still one of the most economical roofing materials out there, with the lowest upfront costs. If you are interested in an asphalt shingle roof, contact us , and we’ll be happy to talk about the options available for your home. Whether you want to go with the great value of three-tab shingle or want the beautiful look and special properties of premium brands, we’re here to help. Call or email to get your free estimate today!